My cousin and very, very good friend was in town this week. We had a wine and talk session that last until 4am on Wednesday morning. It was so worth it. She’s brave and strong and I’ve missed her so much. My grandmother had surgery to remove a growth from her thyroid. She came out of surgery, with no complications and everything went according to plan. So lucky and thankful for that. 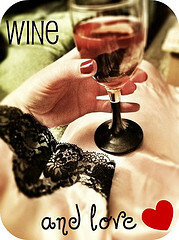 Ladies only #winetoreach this weekend! I got my Moo business cards in the mail — and they were completely free thanks to a Klout perk!